Kyle Busch led 90 of 134 laps in winning Friday night’s NASCAR Camping World Truck Series race at Charlotte Motor Speedway. He took the checkered flag .986 seconds ahead of runner-up Johnny Sauter. The win was Busch’s seventh in 11 starts at the 1.5-mile track, his second of the season in three starts and the 48th of his career. No other driver in NASCAR Camping World Truck Series history has won more races at a single track. After diverging pit strategies under the fifth caution on Lap 71 scrambled the running order near the end of the second stage, Busch took control of the race with a breathtaking pass on the backstretch on Lap 78, splitting the middle between Sauter and eventual sixth-place finisher Matt Crafton. “It was fun,” said Busch, who collected his 173rd NASCAR national touring series win. “We had a really fast Cessna Tundra tonight. It was a challenge there in the middle part of the race. It was confusing for a while there, but we got through it. 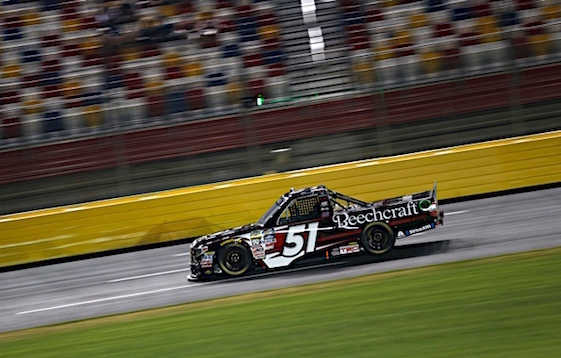 Kyle Busch Motorsports teammate Christopher Bell ran third, overcoming early trouble to stay within striking distance of Sauter, the series leader. Bell started from the pole but cut a left rear tire three laps into the race and went a lap down. Regaining the lead lap as the “lucky dog” for a restart on Lap 65, Bell worked his way to the front. He was running second when a caution for Matt Mills’ spin on Lap 128 brought out the ninth and final caution and set up a three-lap run to the finish. Sauter, who extended his series lead to 15 points over Bell, got the better of the young Toyota driver on the restart and rolled home in second. Ryan Truex charged into fourth place after the final restart and posted his best finish since last year’s season opener at Daytona. It was his first top five in the NASCAR Camping World Truck Series on an open-motor track. Timothy Peters ran fifth, followed by Crafton, Grant Enfinger, Ben Rhodes, Noah Gragson and Parker Kligerman. (4) Kyle Busch(i), Toyota, 134. (1) Christopher Bell, Toyota, 134. (11) Ryan Truex, Toyota, 134. (10) Timothy Peters, Toyota, 134. (6) Matt Crafton, Toyota, 134. (16) Grant Enfinger #, Toyota, 134. (5) Ben Rhodes, Toyota, 134. (15) Noah Gragson #, Toyota, 134. (9) Parker Kligerman, Toyota, 134. (2) Chase Briscoe #, Ford, 134. (19) Austin Wayne Self, Toyota, 134. (8) Austin Cindric #, Ford, 134. (26) TJ Bell, Chevrolet, 134. (22) JJ Yeley(i), Chevrolet, 134. (17) Cody Coughlin #, Toyota, 134. (23) Justin Haley #, Chevrolet, 134. (7) Brett Moffitt, Toyota, 134. (18) Ross Chastain(i), Chevrolet, 133. (27) Spencer Boyd, Chevrolet, 133. (25) Jordan Anderson, Chevrolet, 133. (13) John H. Nemechek, Chevrolet, 132. (28) Stewart Friesen #, Chevrolet, 132. (24) Matt Mills(i), Chevrolet, 132. (14) Austin Hill, Ford, 130. (30) Norm Benning, Chevrolet, 130. (31) Jennifer Jo Cobb, Chevrolet, 130. (29) Wendell Chavous #, Chevrolet, Oil Pump, 106. (20) Regan Smith, Ford, Accident, 101. (12) Kaz Grala #, Chevrolet, Accident, 70. (21) Brandon Jones(i), Chevrolet, Accident, 62. Average Speed of Race Winner: 110.103 mph. Time of Race: 01 Hrs, 49 Mins, 32 Secs. Margin of Victory: 0.986 Seconds. Lap Leaders: C. Bell 1-2; K. Busch(i) 3-42; R. Chastain(i) 43-45; B. Jones(i) 46-48; P. Kligerman 49-54; J. Sauter 55-74; M. Crafton 75; J. Sauter 76-77; K. Busch(i) 78-82; A. Cindric # 83-89; K. Busch(i) 90-134. Leaders Summary (Driver, Times Lead, Laps Led): K. Busch(i) 3 times for 90 laps; J. Sauter 2 times for 22 laps; A. Cindric # 1 time for 7 laps; P. Kligerman 1 time for 6 laps; B. Jones(i) 1 time for 3 laps; R. Chastain(i) 1 time for 3 laps; C. Bell 1 time for 2 laps; M. Crafton 1 time for 1 lap.